Need a 90th birthday cake? I thought this birthday cake to celebrate a 90th birthday was very pretty. I especially loved the "90 Years YOUNG" part too. Although I'm no where near that age, with each passing year, I don't really feel any older, but the clock does keep ticking. I imagine it is the same as you get older too! 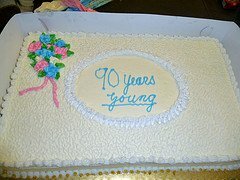 Add your 90th Birthday Cake to this page! Elegant, with soft colors, that could actually work for any age. If planning a 90th birthday party or celebration, you can also use any cake that would honor their interests. Games aren't just for the young, either. Make sure you add some elderly adult games and activities that the entire family can enjoy.